The Travel industry is the poster child for complex logistical processes. 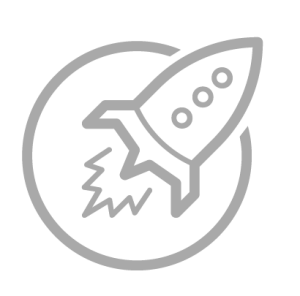 Of course if you supply travel services or a technology supplier within the industry you have to convince that your approach makes the whole experience more efficient, reliable and precise. The layers of delivery logistics and travel regulations and security controls do not make your communication efforts any easier. This is where the Frame Concepts Visual Solutions can help. Making Your Unique Process Intuitive – Three words – pictogram, pictogram and pictogram. Metric Improvements Need Data Visualization– Sometimes improving arrival times, desk reservation times, decreasing security breaches and baggage handling accuracy is measured in fraction of percentages – you need to show the overall positive impact. Innovation Needs to be Translated to Value – the Travel Industry can be seen as set in the ways – you need to get your marketplace excited about your innovation. 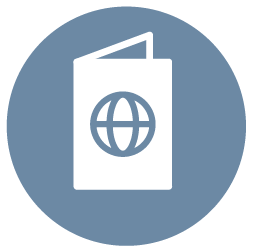 Layers of Complexity Need to Be Unraveled – Your offering can touch the traveler, multiple countries, regulatory bodies, financial systems and the media – you need to highlight your differentiated value in one visual snapshot. No Appetite for Lots of Copy – Your traveler wants to minimize travel time and your audience wants to minimize message consumption time – visuals let them get your solution quickly (and stock photos of airports and bus and train stations have NO explanatory value). 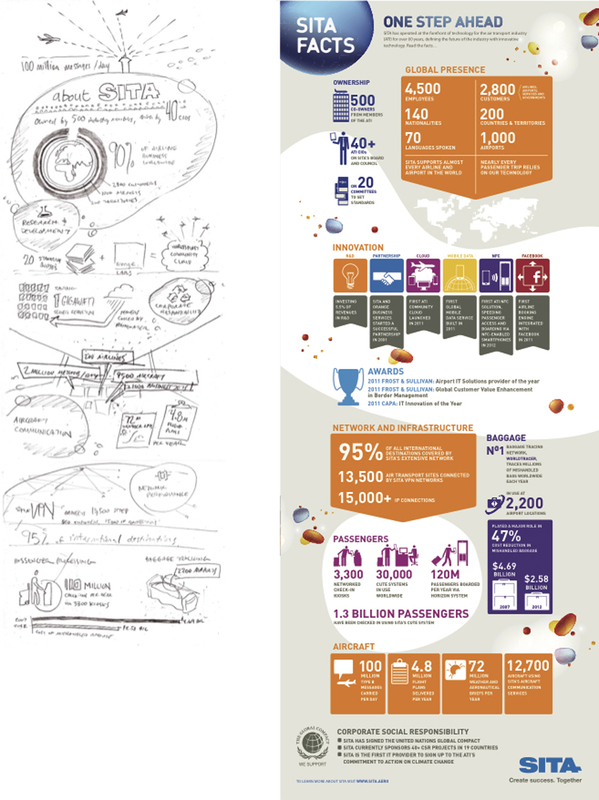 SITA, a world leader in Travel IT Services, showcased their impressive logistics numbers. 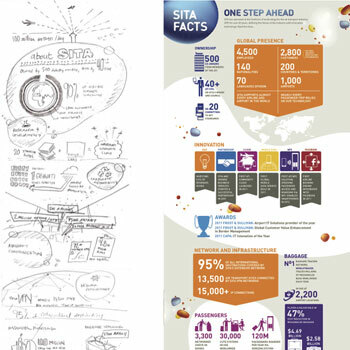 Number of passengers, countries, airports, languages, baggage and technical innovation all served to more than suggest that SITA delivers tremendous value the travel industry. 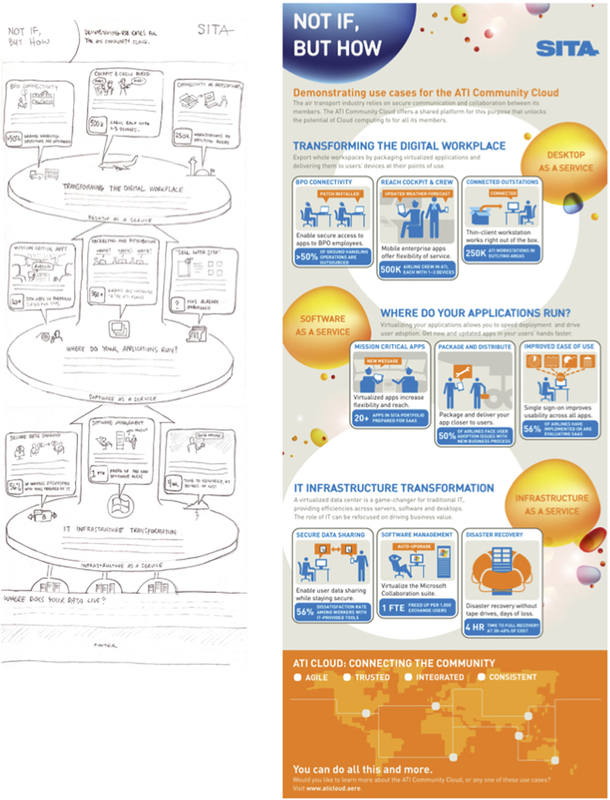 This sample also includes the pencil sketches that are an important part of the process to shape the infographic exactly how the client needs it for their business goals. BrightSpark Travel has a tailored solution that thinks of everything for student travel and showcased each contextualized benefit with a playful meandering travel path and compelling iconography. While the cloud has become commomplace delivery and technical model for the technology industry, no so much for the Travel Industry. 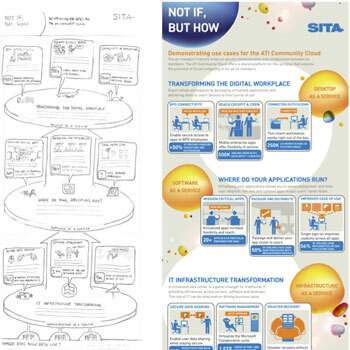 SITA is a leader in this space and has nuanced cloud-based services to the complete airport travel experience. 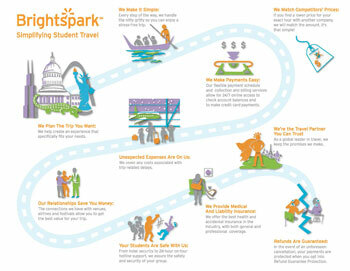 This infographic nets out the “how” and the “why” in one provacitive visual snapshot.